It's the big race, the race that every racing expert dreads because the once-a-year punter in your office or family will base their entire judgment on your punting ability on the hardest race of the year. 30 fences, Going at time of writing Heavy, Soft in Places. - Irish National winner in 2015, relishes the wet conditions, nothing much to show of his form recently. Hasn't finished his last three runs and was unseated in the race last year. Jockey did ride the Iriah National winner over Easter but that's as much as I can find. Save your money. - fourth last year as 8/1 favourite and won the Becher Chase in December to renew his love with this course. High-class chaser who has only failed to complete twice in his career, both at Cheltenham and the latest in Nov 15 --> super reliable  jumper, although he did finish 54L behind Yala Enki last time. Had wind surgery three days later which may prove valuable. Carries 8lb more than last year, but certainly up to the task. - stayed on for third in the Gold Cup and has been a shining light in a dismal season for trainer Tony Martin. The 'handicap plot' king oF Ireland has landed just six winners from 189 NH runners this season in Ireland. That's a dire total for someone who has 119 NH winners in five years. One of those wins was Anibale Fly with the Paddy Power Chase during the Christmas Festival at Leopardstown. Likely to start favourite with Barry Geraghty aboard wearing the famous JP McManus colours, but I can't touch him with the stable in such rotten form. - lining up for his third attempt. Second in 2015 carrying 10-8, only 16th with 11-10 last year. Stable were very keen on him in the Cross-Country at the Festival when third behind Tiger Roll. Big ask to produce his best at his third time, especially with trainer praying for the rain to stop. I'll let him pass. - one of many from Gigginstown House Stud, not sure why they bothered. Hasn't run beyond 3m1f, his rating has fallen away this season with four disappointing results in progressively weaker races, stable out of form. Bad luck if you draw this one in the sweep. - probably starts first or second favourite. Long been mooted as a great chance for this race but blotted his copybook last time when falling in the Gold Cup. Still improving, his official rating improves the further he goes, so if he has suffered no ill effects of the Cheltenham fall, he's the one to beat. - another Gigginstown runner, likely to get plenty of once-a-year punter support with Rachael Blackmore aboard. Last of the finishers at Leopardstown in the Irish Gold Cup at her only previous time on him. Has elements of form and ran eighth in the Irish National last year. Very safe jumper, only one fall back in 2015 in a G1 hurdle, and one Pulled Up. Trainer Mouse Morris is a wily old character, a bold run better than recent form wouldn't surprise. Consider backing him to finish at least. - Pulled Up last year, and beaten around 50 lengths at his last two starts (not on heavy tracks). Drops 3lbs from last year and did win at Cheltenham in November. Nice to have a runner in the race of the nation, but he's 66/1 for a reason. Can't see him being competitive. - 50/1 last year (PU) and similar odds again this time. Second at his last four starts, all on heavy going but isn't as ground reliant as it seems. Runner-up in the Ultima on the opening day of the Festival, six lengths (and 8lbs) better than Vintage Clouds, the reserve who several shrewd judges were giving a decent show here. Wanted to run again in the Gold Cup, indicating connections have a very big opinion of him but didn't pass the vet test. Not the worst chance here, has the class and no concerns about the conditional jockey aboard - he is very good. Worth a nibble if you find a firm paying six or seven places. - there was some trends nonsense about French-breds being hopeless in the National, and then they've won three of the past nine editions. The race evolves, the industry evolves, the handicap scale evolves. Trends, schmends! Tenor Nivernais ran 17th last year, but since then he doesn't have much to show for it. Pulled Up on seasonal return in January, then last, beaten over 40 lengths at Ascot. On the flipside, Venetia Williams is a superb handler of staying chasers, and while earlier in the season the stable was off-colur, it is firing now, with nine winners from last 22 runners. Stranger things have happened. - 12yo who has only beaten one horse in four runs this season. Winner of five Irish Grade 1s at Leopardstown and Punchestown but on the rapid decline and reckon this will be his racing swansong. Not run since Xmas, I'd be amazed if he finished the course. - reliable jumper, has finished every race under rules (i.e. doesn't include P2P racing). Plenty of racing at three miles and beyond, no runs on a heavy track, drops a lot in weight (lightest impost he's ever carried), trained by the very shrewd Sue Smith. Might be able to hang around for EW money at a huge price. - three-time Cheltenham Festival winner who must be right in the mix here. Stamina not a concern, nor is drying ground. Trainer and jockey have the big race expertise, the only negative for him to me is his price now compared to a month ago. - some of the Trends boys have put this one up. Ran eighth last year at 33/1, possibly underdone having 70 days since his previous start. Won last time out at Ascot, against a couple of today's rivals (Vieux Lion Rouge and Tenor Nivernais). Ran a nice third in the Ladbrokes Trophy (formerly the Hennessy in December, beaten under 10 lengths by Total Recall and is 9lb better off here. Not convinced about his toughness though, has been pulled up at six of his last 12 starts which doesn't exude confidence. - exceptional jumper with just one 'unseated' result in his career, all the rest have been completions. Started 12/1 last year when finishing sixth, and 66s the previous, beaten 48L into seventh. Won two lead-up runs coming into last year's edition, form not as glamourous this time in and like The Last Samuri, I can't warm to a horse having his third crack at a race this tough. - won the Midlands National last year so stamina should be no concern but his last two runs (both pulled up in larger fields in heavy going) are a worry. Does not enthuse. - finished ahead of L'Ami Serge (first day winner at Aintree) last time out in the Skybet Chase at Doncaster. Hasn't run beyond 3m2f but still on the improve. No worse than fifth in his last 11 completions (overlooking just one unseated). Jockey has strong affinity with the horse, and from strong stable. Can win. - very lightly raced 10yo, just 16 starts under Rules, with formlines through Bristol de Mai, Blaklion and Vicente. Surface won't bother him, and going for a second straight win for Scotland. Third at Newbury last month, in his only run in just over a year. Ran third in Scottish National two years ago so no concerns about the trip. Big chance. - ran fifth last year at 50/1, suffering mild interference at the last two fences, knocking a bit of momentum from him. Won the Sefton over these fences in December. A 12yo hasn't won since Amberleigh House in 2004 but has to be one of the best chances to achieve it in that period. Has been very reliable since joining Ian Williams two years ago, his only fall was in October when leading clearly here in a veterans' chase. Must be given some chance. - easy winner of the Peter Marsh at Haydock in January then eased up in heavy conditions on GN Trial day. Can we forgive that on drier ground? Started 9/2 that day vs 9/4 for Blaklion at same weight gap. Beat Captain Redbeard in the Peter Marsh, place chance at the very least. - ninth last year (started 11/1) when made a big mistake at Valentines the second time while right in contention. Only two runs since, beaten a long way behind anibale Fly at Leopardstown and pulled up in the Thyestes. Arrived at the top of his game last year, would need a sharp improvement to be in the finish. - same formline as Pleasant Company this season, second to Anibale Fly and pulled up in the Thyestes. Back for his third attempt (sixth, unseated), and likely to start shortest of all three. Not on my list but can certainly make a case for him. - third last year, pulled up in only two starts since - both at Cheltenham. Having a fourth crack at it, second to Many Clouds in 2015, pulled up in '16, third last year. Obviously loves the course but at 12, and with two recent failures, I'll say no. - pulled up on a heavy track last start, his only run beyond 3m. Bottom of the weights but must be a major stamina concern. - 13yo who won the Welsh National in January, and was eighth to Pineau De Re back in 2014. Pulled up last year but if the ground stays wet, it might just bring him into it. Hasn't run since Jan 6, that's a long break coming into this punishing test. - lightweight hope. Bolted in at Catterick in the North Yorkshire National off a big weight, and just might relish another half-mile. Traditionally a bit young for a GN winner but two of the past three have been 8yos - trends evolve over the years. Big fan of Sue Smith the trainer, interesting runner. - solid 3m chasing form last season, disappointing two runs this campaign. Has had a wind op since, from shrewd stable. Big price with significant potential for upside. - 7yo mare seeking to defy some serious history. A mare hasn't won since 1951 and 7yos haven't been successful since 1940, although 8yos have won two of the past three runnings. Has been strongly supported this week since Katie Walsh was confirmed as rider. Strong staying form, running well in Welsh & Irish Nationals in previous seasons, that experience bodes very well now. Ignore the trends and she is right in this. - one fall, once unseated from 53 jumps starts. That's all I can find in favour of this 13yo. - would love to see it keep raining, winner of four out of seven starts on heavy going. Two poorer runs this campaign have been over hurdles as we presume his trainer wanted to preserve his Chase handicap mark. Finished 12th two years ago after making a mistake on the second circuit and losing momentum. Don't underestimate him. - minimal experience over the big fences, just four chase starts, although he did beat Edwulf and Bentelimar in one of those. Pulled up in the Irish National trial at only start on heavy. I would keep my eyes on this one for next year. - Gold Cup winner of 2014, hasn't won a race since. Pulled up in 2015 edition, seventh last year. Fell in the Becher back here in December, hasn't run for four months. At the grand old age of 12, I'm guessing this will be his last race before enjoying life in a paddock. - will be popular with parents of young children, named after a pirate in animated kids' series Ben & Holly. Ran sixth in the Grand Sefton over these fences in December, and 1-2-1 since then, all on heavy. The second was a fading one in the Peter Marsh, his only try at 3m or beyond, which stretched his stamina. Not this year. - loves a stamina test. Last season he was third in the Welsh National, fourth in the Midlands edition and 10th behind One For Arthur here. Has set sights lower this season, perhaps to leave something in the tank for this race or was it just reality of age setting in? Never underestimate a Venetia Williams veteran, remember Mon Mome? - trained by Gordon Elliott but the formline says PP1FP. Second here in the Irish edition in 2016-17, dropped out in the heavy going at this year's attempt. Can't have a bar of him this time even with young gun Jack Kennedy aboard. - sure to see plenty of attention with Bryony Frost aboard. She won the G3 Classic Chase at Warwick on him in January. More recently he ran second in the Midlands National on a heavy track, fifth in the Eider, so the miles are certainly in the legs. Will be unders, this mark is too high for him. - beaten a long way in the Kim Muir at Cheltenham, ran third in the Welsh National beaten 15L. His best is a long way short of this class. - veteran who will give backers plenty of sight up near the front of the field. Was running well last year before his saddle slipped and had to be pulled up. Concerns about his stamina on a heavy track but at 100/1, you're getting compensated for that. 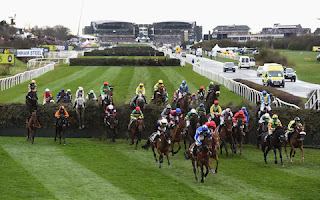 - not won since Nov 2015, beaten 25L+ in his last five starts and while his handicap mark now is more attractive, 25lb below his peak, it's going backwards for a reason, and the Grand National isn't the race to suddenly find form again. I barely have any more clue than your crazy aunt using a dartboard or on which kitchen tile the cat sits on, but make what you will out of these. and box them up in a forecast so you can buy a new car if it lands!